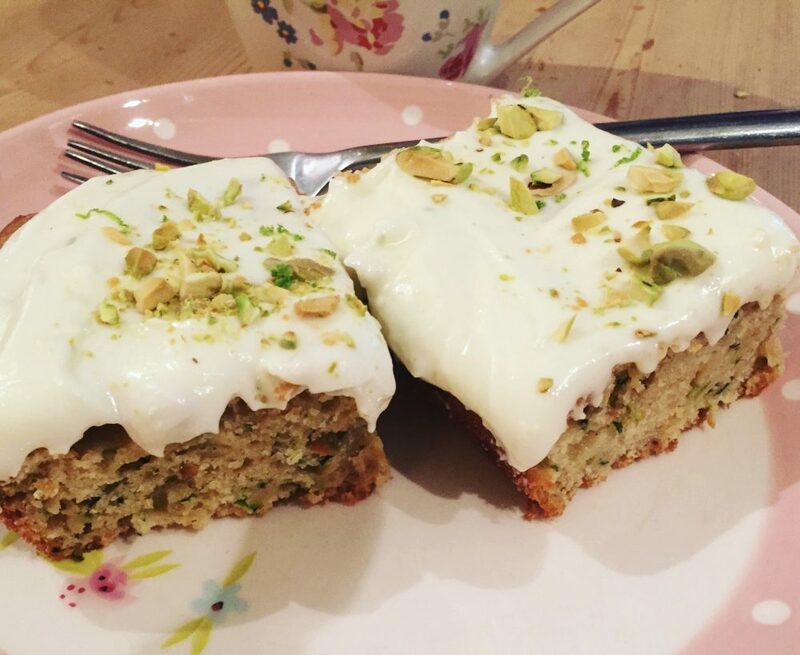 Courgette, Lime and Pistachio Cake. I love baking cakes. I bake a lot. My only problem is, when I bake a cake, there is usually only my husband or me to eat it. This in turn can lead to a sweet tooth and a tiny bit of cake-related-middle-aged-spread. Which is why I was totally thrilled to bits when I found out I could swap cake for bags of well-rotted horse manure. I can indulge my love of baking all things sweet and in return, I get to fill up my raised beds for free. Well, for the price of some flour, butter, eggs and sugar anyway. You have to love the countryside, where good old-fashioned bartering is still alive and well. It’s really simple to make and it uses courgettes which, quite frankly, is a minor miracle. Last year, our courgette harvest was so big that everyone was totally sick of the sight of them. I can’t imagine that I will have the same problem this year. I will simply turn them into cake. Line a loaf tin with baking paper and pre-heat the oven to 170C/340F. I used a rectangular cake pan because I didn’t have a loaf tin but be careful if you use something other than a loaf tin because it won’t take as long to cook. Whisk together the eggs, sugar, oil, yoghurt, vanilla essence, lime zest and juice in a large bowl. Stir in the courgettes and then fold in the flour and baking powder and most of the pistachios (save some to sprinkle on top). Pour the mixture into the loaf tin, then bake for 45 to 50 minutes or until the loaf is risen and golden and a skewer poked into the centre comes out clean. Then cool completely on a wire rack. Meanwhile, make the icing. Beat together the cream cheese and butter, then add most of the lime zest and the juice. Finally, stir in the icing sugar. Keep adding more icing sugar until the icing seems thick enough to sit on top of the cake without sliding off! When the cake is completely cool, spread the icing over the top. Decorate with the remaining nuts. One tip, make sure that you buy ready shelled pistachios because believe me, they are a total pain to shell. It takes absolutely AGES! I’ve saved your recipe as it looks so delicious. Also followed the new blog address on Bloglovin.